Life on a pirate ship was definitely not for the timid. It smelled, it was dangerous, and getting paid involved finding another ship to plunder, and then plundering the heck out of it. But all that meant was that the successful pirates were some of the baddest sea dogs on the high seas, and they sure dressed like it, too! 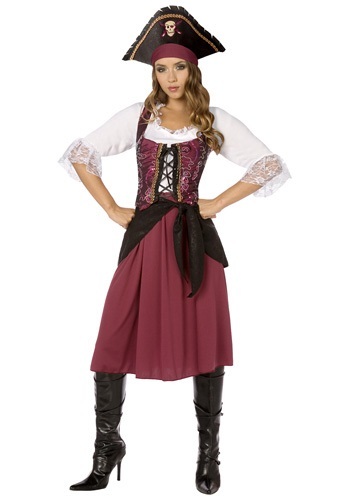 This costume comes with all the garments you'll need to become a fashionable pirate wench. Although, people may be a little hesitant to call you “wench”, especially if you add a fierce looking pair of buckled boots to your lacy and colorful outfit, and brandish a big toy cutlass and pirate pistol. With such a dashing look, everyone will probably refer to you as “M'lady” instead!